This study took part on June 21 (Tues.) and was part of a Department of Art Research, Archives, and Information Systems research project on the Multi-faceted Study of Artistic Representations and Art Materials and Techniques. With the cooperation of Inuzuka Masahide of the Center for Conservation Science and Restoration Techniques and Hagiwara Hajime, adjunct instructor at Musashino Art University, Tsuda Tetsuei and Sarai Mai of the Department of Art Research, Archives, and Information Systems studied and photographed a wooden statue of the monk Shoshin (a cultural property designated by Gunma Prefecture that was sculpted by Daishin in the Kamakura period) from Hofuku-ji temple in the Town of Itakura, Gunma Prefecture on exhibit at the Gunma Prefectural Museum of History. Researchers had become aware of the statue’s existence following a full-fledged study by the late Kuno Takeshi, an emeritus researcher at the Institute, in which Kuno became aware of the statue’s inscriptions. Some time later, the statue underwent full-scale restoration, but its obtuse and complicated inscriptions remained unclear. The aims of the current study were to accurately ascertain the statue’s structure and the conditions under which it is kept and to use infrared photography to discern its undeciphered inscriptions. This study also sought to verify the existence of a container holding the monk’s bones in the head of the statue. X-ray photography was attempted to meet these goals. Plans are to continue studying the statue and present findings and photographs from the study in Bijutsu Kenkyu. From February to June of this year, Liu Chi-chun of the Art Institute of National Taiwan Normal University served as a visiting researcher in the Department of Art Research, Archives, and Information Systems. During his research, Mr. Liu used the Institute as his base of operations. Mr. Liu specializes in Taiwanese art under Japanese colonial rule and in his current research he sought to look at trends in the Nanga (Southern School of painting) particularly in modern Japan. 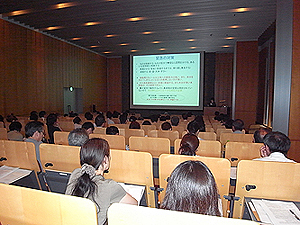 Although Mr. Liu had to temporarily return home during his research due to the Tohoku Earthquake and Tsunami, he finished collecting materials in June and presented his results on June 29, 2011 at the 3rd Conference of the Department of Art Research, Archives, and Information Systems. Mr. Liu’s presentation was entitled Searching for the Identity of Taiwan’s Traditional Calligraphy and Painting under Japanese Colonial Rule. This serious presentation looked at individuals with a mix of Taiwanese and Japanese thought through statements at the time concerning Nanga. As Mr. Liu explained, these individuals were caught in the gulf between the 2 frameworks of traditional “calligraphy and painting” common to East Asia and “fine art” as was brought about by the West after the modern age. Following Mr. Liu’s presentation at the Conference, Minami Asuka, professor at Sagami Women’s University, made a presentation entitled Appraisal of Muromachi-period Paintings by Georges de Tressan (1877－1914). De Tressan was a soldier in the French army with a fondness for Japanese art, and a number of his discourses remain. Ms. Minami has labored several years to verify de Tressan’s achievements, which had been forgotten. Her presentation focuses on de Tressan’s appraisal of Muromachi-period paintings, and she discusses where he drew his information from, characteristics of his discourses, and their significance at the time. Japanese art researchers from the Institute and experts in French art from other organizations attended a discussion following the presentations, and opinions were actively exchanged regarding appraisals of Japanese and Oriental art in Europe during the early 20th century. 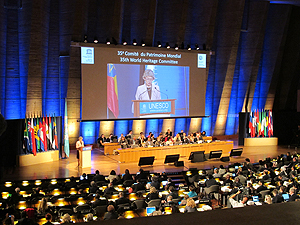 The 35th World Heritage Committee was held at UNESCO Headquarters in Paris from June 19 to 29. The Committee was originally to be held in Bahrain, but the venue was changed two months prior due to anti-governmental protests in Arab countries. Unlike usual committee meetings, no opening ceremony was conducted and there were no excursions to sites. There appeared to be fewer participants than usual because the Committee limited the number of delegates from parties other than Committee Members. The Committee placed 25 properties, including 3 natural, 1 mixed, and 21 cultural heritage properties, on the World Heritage List. The Advisory Bodies (ICOMOS and IUCN) had recommended the inscription of 12 items, but this number doubled as a result of discussion among the Committee Members. There are four levels of recommendations from the Advisory Bodies, and second from the lowest is “deferral of inscription.” Ten properties that had been deferred were inscribed on the List. The lowest level of recommendation is “not to inscribe” a property, and the recommendation was made to not inscribe the architectural work of Le Corbusier, which includes the National Museum of Western Art. However, the Committee decided instead to defer inscription. Since last year, recommendations from the Advisory Bodies have tended to be overturned by the Committee, and this year that tendency was even stronger. State Parties to the World Heritage Convention have complained about the lack of transparency in the process of finalizing recommendations from the Advisory Bodies, but some Committee Members said that the flood of decisions disregarding the opinions of specialists would damage the credibility of the Convention. Political conflicts also emerged regarding properties that had already been inscribed or that were to be inscribed on the List. As an example, the Preah Vihear Temple located on the Cambodian-Thai border was inscribed on the World Heritage List in 2008. Since the inscription, armed conflicts have erupted between the two countries because of the unclear border demarcation near the temple. During the Committee session, Thailand announced its intent to withdraw from the World Heritage Convention because they were unsatisfied with the lack of information on plans to manage the site and the lack of transparent decision-making. Opposition arose as to whether to discuss or to avoid discussing issues involving Kosovo and Serbia and Israel and the Arab states. Ogasawara Islands and Hiraizumi, both properties nominated by Japan, were inscribed on the World Heritage List. During the discussion, the chairperson of the Committee expressed condolence to the victims of the recent earthquake and tsunami. The inscription of these properties should have a beneficial effect on the recovery of stricken areas. Japanese antiquities located overseas serve to introduce Japanese culture, but these items are suffering from aging and differences in weather and climate, preventing many of these works from being displayed. 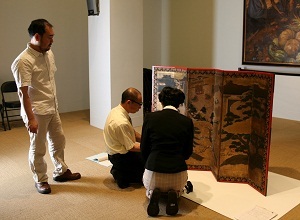 Thus, the Cooperative Program for the Conservation of Japanese Art Objects Overseas seeks to preserve these works in a consistent state so that they can be put on display. 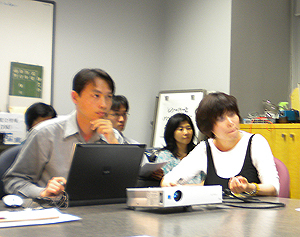 Prior to last year, the program was a project of the Center for Conservation Science and Restoration Techniques, but starting this year the program is being managed by the Japan Center for International Cooperation in Conservation. From the standpoint of restoration, the program studies and repairs artwork in conjunction with art history researchers from the Department of Art Research, Archives, and Information Systems. Last year, we surveyed museums in the US, Australia, and Europe with Japanese paintings in their collections in order to ascertain the latest conditions. Twenty-five institutions responded to questions regarding whether or not they had works in need of restoration and how they conserved and restored works at their institution. Based on their responses and a list with images of the works, program experts consulted the curating institution with regard to how works were viewed in terms of art history, what works needed restoration and what works needed immediate restoration, and what the institution had done in response. This year, we conducted our survey at 2 art museums in the US. On June 24, we surveyed 6 hanging scrolls and 6 folding screens at the Cincinnati Art Museum (Ohio), and on June 27, we surveyed 3 hanging scrolls and 5 folding screens at the Kimbell Art Museum (Texas). This year marked the program’s first visit to the Cincinnati Art Museum, which was founded in 1881 and is one of the oldest art museums in the US. The Cincinnati Art Museum is a major art museum in the Midwest with a collection of about 60,000 pieces. The Museum’s collection primarily contains Western art, but the Museum also has a collection of Japanese art, and many of the pieces are unknown in Japan. The study has occasioned technical exchanges, and the program will continue to encourage consultation with relevant personnel and curators. This study examined techniques of crafting Kurume Ikat, which is designated an important intangible cultural property, by visiting members of the Society to Preserve Ikat from June 27th to 28th. Ikat is a decorative fabric woven with a weft and warp that are dyed differently depending on the pattern. The picture shows how ikat is woven by adjusting the weft and warp in order to create certain patterns on the cloth. 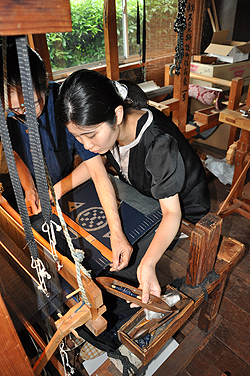 Kurume Ikat also uses araso, a hemp fiber, to prevent dyeing of the weft and warp. Manufacture of this araso is a selected preservation technique and is thus nationally protected. Plans are to conduct additional studies of these techniques firsthand and their preservation. Hut on a cliff where young cormorants are caught in flight. 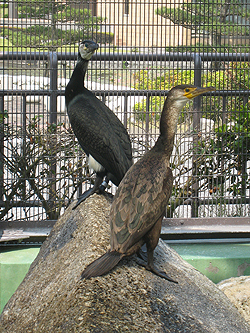 This study examined techniques of catching Japanese cormorants (an intangible folk cultural property of Hitachi City) in Jyu-o Town, Ibaraki Prefecture from June 7th to 8th. 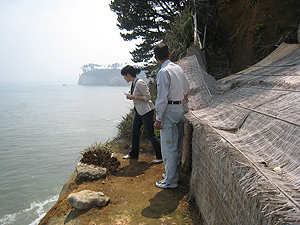 Most of the wild Japanese cormorants used in cormorant fishing, a traditional fishing technique now found mainly in western Japan, are caught here in Jyu-o Town at a little hut located on a precipitous cliff facing the Pacific Ocean. Both the technique and the present status of its transmission were studied. The hut had been affected by the collapse of the cliff due to the huge earthquake in March but had been repaired by cormorant catchers before the spring cormorant season starts (from the end of April to the middle of May). In all, 11 cormorants were caught and sent to fishing sites around the country. Plans are to visit the site again in the autumn cormorant season and to study the techniques firsthand. In light of the reality of the vast damage to cultural properties done by the tsunami that accompanied the Tohoku earthquake, Ms. Kigawa gave a lecture on the subject of Initial Efforts to Rescue Cultural Properties. Participants were then given a demonstration of the “Squelch Drying technique,” which was one of the initial efforts used to preserve water-damaged paper materials. The training session had 88 participants. Attendees represented close to 15% of the individuals who had completed training for conservators over the last 30 years or so. The Center was pleased to see such good attendance, and this turnout impressed upon us at the Center the need to continue improving ourselves by offering even better sessions in the future. 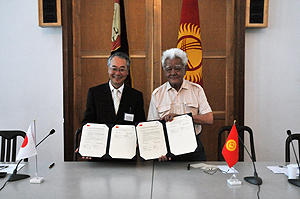 On June 27, 2011, the National Research Institute for Cultural Properties, Tokyo (NRICPT) and Institute of History and Cultural Heritage, Academy of Science of the Kyrgyz Republic concluded an agreement and memorandum of understanding to protect Cultural Heritage in Kyrgyz. NRICPT will conduct a training program and a program on conservation of cultural heritage with the Institute of History and Cultural Heritage and jointly organize a symposium with the Institute. This autumn, NRICPT plans to conduct a program to train Kyrgyz personnel in documentation, excavation, conservation, and maintenance of historical sites in the medieval town of Ak Besim along the Chu River.